I’ve been working on this assignment* for months, first with drawings, gouache studies and finally this painting. It’s done from my imagination, which is not a common way for me to work. It depicts me at 15 when in 1969 my family moved from smoggy Southern California to Westchester County, New York. I had just learned to ride horses and they helped find a way out of the anger and sadness I felt about leaving California and my friends. *Childhood Memories was a challenge to a Facebook group to which I belong. The administrator is a well-known art teacher, who exposes to us to his vision, knowledge and excitement about art, alongside his own spectacular, imaginative, paintings. Though he didn’t like the term “assignment”, I found it to be just the thing in the face of so many personal distractions lately. Thank you Chester Arnold! I will paint this way again, so fun! 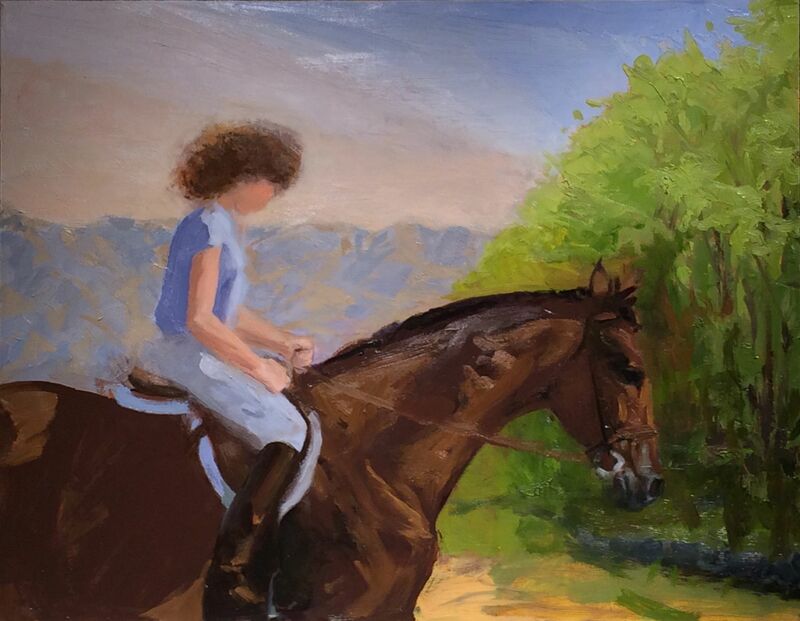 This entry was posted in Uncategorized and tagged horses, Painting. Bookmark the permalink. That is a beautiful painting, Candy. Do you think Chester Arnold would let me join that FB group? I have always admired his paintings, his dramatic use of color and line. It could inspire. I like it a lot. It has a lot of feeling. Love to see you painting horses, and this brings back that time so vividly. You caught it! Hi Beth, Yes, I was referring to photos with you on Peaches, Kathy on Henry with the beautiful snow-capped San Gabriels in the background. So many memories. It’s fun to paint memories.